Bring a large pot of water to a boil over high heat. Meanwhile, cut a small X in the bottom of each peach using the tip of a paring knife. Put the peaches into the boiling water for 1 minute. Remove them from the water with a slotted spoon and transfer them to a large bowl. Let them cool just until they are comfortable to handle. The brief blanching should make it easy to peel the skins off of the peaches by hand, but use a knife if you hit any stubborn spots. Compost or discard the skins. If you are working with freestone peaches, run a knife around the circumference of each peach. Its halves should be easy to twist apart. Discard the pits. 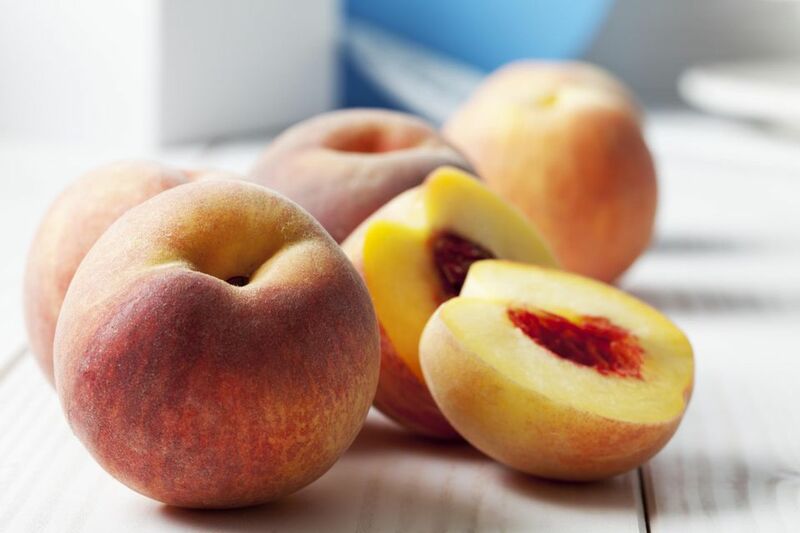 If you are working with clingstone peaches, it's easier to remove the peach flesh from the pit using a paring knife. Simply slice off small chunks until you've removed as much as you can. Discard the pits. Chop the peeled and pitted peaches into approximately 1/2-inch chunks. Combine all of the ingredients in a large pot over medium-high heat. Cook, stirring frequently, until the peaches soften to the point that they start to fall apart when you stir the chutney. If the chutney seems too liquid at that point, raise the heat to high and continue to cook it until a wooden spoon dragged across the bottom of the pot leaves a trail that doesn't fill in with chutney even after a couple of seconds. The flavors of the peach chutney will develop and become more balanced if you wait at least a week before eating it. Store peach chutney in the refrigerator for up to 2 weeks. You can freeze chutney for up to 6 months (it is still safe to eat after that, but the quality will suffer). For longer (up to 1 year) storage at room temperature, follow the canning instructions below. Ladle the chutney into clean pint or 1/2-pint canning jars (it is not necessary to sterilize the jars for this recipe because of the length of the canning time). Leave 1/2-inch of head space. Wipe the rims with a paper towel or clean dishtowel. Screw on canning lids and process in a boiling water bath for 10 minutes. If you want to use homemade apple vinegar in this recipe, be sure to test it first to make sure it is acidic enough to safely preserve the chutney.